Oduvil Unnikrishnan (13 February 1943 – 27 May 2006) was an Indian film actor. 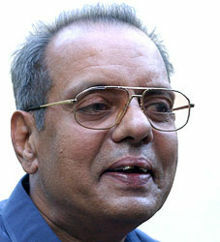 He was known for his versatile acting skills, shown in his portrayal of classical ancient aristocratic personalities in Malayalam cinema with his unique provincial linguistic style, expressions and dialect. He was noted as a serious as well as comic actor. He composed music for an album named Parasuram Express (1984) to lyrics written by Bichu Thirumala and an unreleased film named Sarvam Saha directed by Ravi Gupthan. Oduvil Unnikrishnan was born on 13 February 1943 in Wadakkanchery, Thrissur, Kerala, India to Vadakkancheri Enkakkatt Oduvil Veettil Krishna Menon and Parukkutty Amma. He had his primary education from Government Boys' High School, Wadakkanchery. His uncle Sarasakavi Oduvil Unnikrishna Menon was a noted Malayalam dancer. Unnikrishnan was interested in music since his childhood, and he learned vocal music and percussion instruments like mridangam and tabla. His trainer in vocal music was Kalamandalam Vasudeva Panikker. With his knowledge of music instruments, he joined some orchestra groups. He later joined renowned Malayalam theatres like K.P.A.C. and Kerala Kalavedi. His major job in those theatres was that of a tablist. He also sang many songs and composed songs for many albums, like 'Parasuram Express' an album named after the train through the places where it goes. He performed many fill-in roles in plays as well. That was his first experience in acting. Oduvil Unnikrishnan debuted the film industry in the late 1970s with a role in Darshanam, directed by P. N. Menon. His second film was Chenda, directed by A. Vincent. His early notable roles were that of a mahout in Guruvayur Keshavan, directed by Bharathan and as Subbaiyer in Sarapanjaram, directed by Hariharan. He earned public recognition through character roles in films directed by Thoppil Bhasi, Hariharan and Sathyan Anthikkad. He has acted in more than 400 films. His memorable roles include those in Nizhalkuthu, Kathapurushan, Thooval Kottaram, Sargam, Yodha, Ponmuttayidunna Tharavu, Oru Cheru Punchiri, Aaram Thamburan and Manassinakkare. He could even make very brief roles like that of an idaykka player in Devasuram, directed by I. V. Sasi very memorable.He was regularly cast in films with Jayaram as the lead hero. He won the Kerala State Film Award for Best Actor once and for Best Supporting Actor twice. Unnikrishnan married Padmajam in 1975. They have two daughters, Padmini and Shalini. Oduvil Unnikrishnan was suffering from kidney problems. He underwent dialysis at hospitals in Malappuram and Thrissur. Later, he was admitted to a private hospital in Kozhikode. He died there on 27 May 2006 at 6 am due to renal failure. His body was taken to his birthplace at Wadakanchery, Thrissur and cremated at Ivarmadam, Pampady, nearby. Parasuram Express (1984 album): lyrics by Bichu Thirumala; singers K. P. Brahmanandan, K. S. Chitra, Krishnachandran, Lathika. Sarvam Saha (unreleased movie) directed by Ravi Gupthan. ^ "Mangalam varika 6 Aug 2012". mangalamvarika.com. Retrieved 29 October 2013. This page was last edited on 23 February 2019, at 10:45 (UTC).